Amanohashidate is one of the ‘Three Views of Japan‘ (日本三景 / Nihon Sankei), the other two being the pine-clad islands of Matsushima and the torii at Itsukushima Shrine on the island of Itsukushima, popularly known as Miyajima. The name ‘Amanohashidate’ means ‘Bridge to Heaven’. I’ve never been to Amanohashidate, but doesn’t it look spectacular? The sandbar (the ‘bridge’), which is 3.3 km long and covered with about 7,000 pine trees, is a thin strip of land connecting the two sides of Miyazu Bay in northern Kyoto Prefecture. 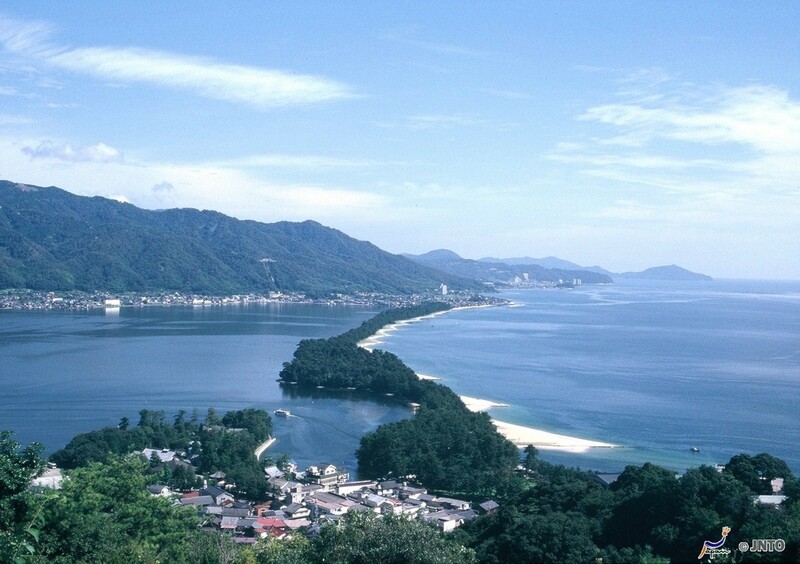 It forms part of the Tango-Amanohashidate-Oeyama Quasi-National Park, and you can actually walk all the way along it. Amanohashidate Station (marked on the map above) is on the Miyazu Line railway, and is about two hours from Kyoto Station or Osaka Station. 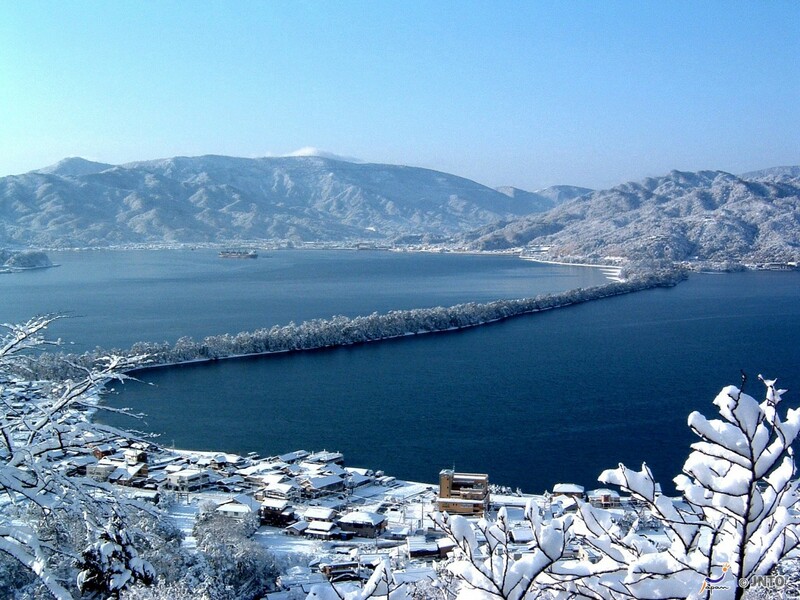 The actual town of Amanohashidate is split into two parts – one at each end of the sandbar. The station is at the southern end, along with a number of hotels, ryokan (Japanese inns), restaurants and a temple. 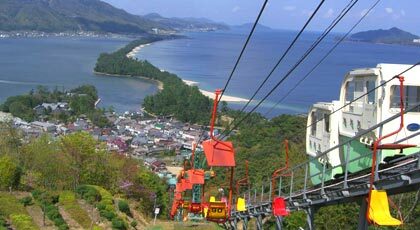 From the southern end of the ‘bridge; you can take a chairlift or a monorail (below) up to Amanohashidate View Land, which is an observatory at the top of Mount Monju. From there, you can see the view of the whole sandbar, which must be beautiful. At the northern end you can also view the sandbar at Kasamatsu-koen. 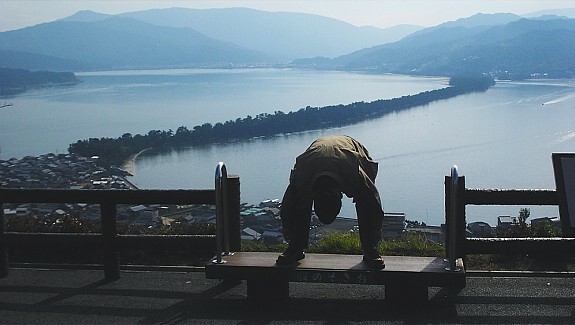 According to my Lonely Planet Japan guidebook, “You are supposed to view Amanohashidate by turning your back to it, bending over and observing it framed between your legs! (It supposedly makes Amanohashidate look like it is ‘floating’.)“. 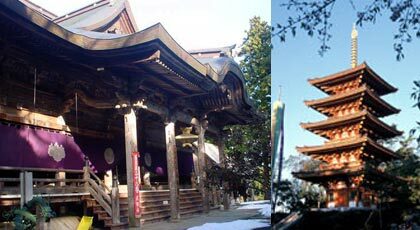 Other than the view itself, there doesn’t seem to be an awful lot else to do in Amanohashidate, but there is a popular temple called Chion-ji at the southern end and another called Nara-ji at the northern end. 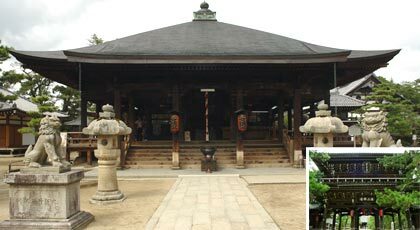 Chion-ji is supposed to be a good place to visit if you wish to achieve something academic (like passing a test), and Nara-ji is good for making your wishes come true. Amanohashidate looks like exactly the kind of place I would love to have a day trip or overnight trip to, as I love places where I can see an impressive view and wander around temples. Reading about Amanohashidate and seeing these pictures is making my feet very itchy indeed! Amanohashidate is really beautiful and makes a nice day trip from Kyoto! I visited it AND Fukuchiyama Castle on the same day! I haven’t posted about it yet, although I went there over a year ago. Thank you for making a great suggestion – I wouldn’t have thought of Amanohashidate otherwise. I’m looking forward to your post on it in the future too! Hahahaha I probabaly would really look at the island through my legs just to see if its true!